I am not sure my posts are worthy of posting on such an esteemed blog, but I will share with you a recent blog post that my readers enjoyed. 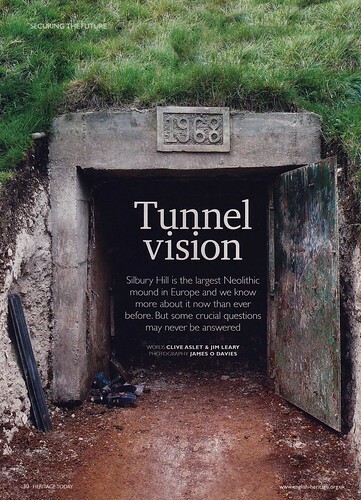 The May edition of Heritage Today has a very interesting article on the latest discoveries regarding the mysterious Silbury Hill. The hill is near Marlborough just on the edge of the A4. In 2000 a large hole opened up and archaeologists and engineers teamed up to find a solution. The hole was caused by a shaft that had been sunk by the Duke of Northumberland in 1776. Furthermore the soil was seeping into various tunnels that had been channeled into the hill over the years. The largest tunnel was created by Professor Richard Atkinson in 1968. The BBC sponsored him to carry out the dig and Magnus Magnusson presented a programme from within. The entrance can be seen in the following picture (from Heritage Today magazine). To repair the hill all the voids had to be filled from the middle outwards with bags of chalk followed by a chalk and water mixture. The door to the entrance has now been placed in the nearby Alexander Keiller Museum in Avebury. There have been many theories as to the significance of the hill; burial chamber for an ancient king, a platform for druid sacrifices and astronomical observatory are among the suggestions. The stabilising of the structure enabled archaeologists to shed a bit more light on the hill. It is now certain that there was no burial beneath the mound. A piece of pottery at the site has also established that the Romans had a settlement there. Due to radiocarbon dating using pieces of antler it has now been established that the hill was started around 2400BC and probably went on for several hundred years. It is composed of a series of layers secured by stakes, then gradually built on top of. The mound eventually got covered by different layers of local material; clay, chalk, topsoil, turf and even some sarsen stones. Whilst looking in the main tunnel the archaeologists realised that the hill had started off as several mounds which later joined into the single mound, initially it stood 5 metres high. The mound grew to 25 metres high, the top part consisting of chalk that had been quarried from an adjacent ditch. At this stage it appears that the mound was left for a while as there is a layer soil showing signs that grass had colonised it. After this rest period more chalk was piled on top until the hill eventually stood at 37 metres high. It is the largest prehistoric mound in the whole of Europe that has been hand made by humans. I shall leave you with the final paragraph from the article. 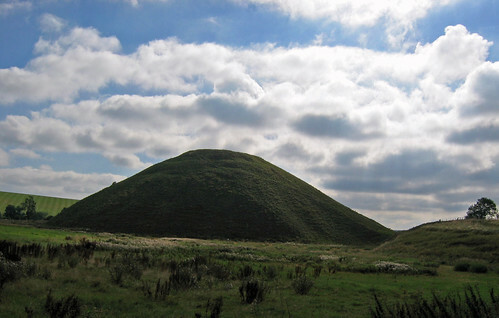 Silbury Hill has been called the British equivalent of the pyramids, but why did Stone Age man build it? Nobody knows, exactly. Quite apart from any ritualistic significance Silbury may have had for its builders, just constructing it would have been its own reward. Having such a great shared purpose would have helped the community to cohere. Perhaps future generations will say something similar of the people who came to repair the monument in the early twenty-first century. why has Silbury been mended? Because our nation is strengthened through doing it. More interesting facts about the mound can be found on the Silbury Hill page of the English Heritage website. I mean, does it look just like a little grassy hill, would people realise it without seeing the entrance. I enjoyed this on your blog recently Cherie and think it very worthy of posting here. I knew nothing about this, it sounds really interesting. Like Paul Bahn said, anything with no obvious purpose is classed as ritual, lol. But its a very mysterious hill, as the first thing you notice about it is that it must have been man-made and the view from the top is quite nice. Can't see them having expended all that time and effort just for the fun of it though. I guess there are some questions on this side of life that will never be answered. Nunyaa - It is a grassy hill but you can tell it is not natural, it looks a little out of place and interesting! This area is full of interesting and amazing stuff! Ginro - It is a very mysterious hill and I agree we are going to have to wait for the answers! It is much more imposing, nunyaa, than the pics. I climbed up in ~Nov. '79 and the mystery only expanded. Several Leys line on this perfect truncated cone. By the way, you could find talk of CROP circles in the nearby pubs even then, tho I was researching stone circles. Go to Wikipedia (don't believe it all);they have a pretty good bibliography on it.